her memory blanked out, her parents can’t cope. In hardcover now and releasing in paperback on 11 April 2017, The Art of Not Breathing takes us where memory just cannot go. Book info: The Art of Not Breathing / Sarah Alexander. Houghton Mifflin Harcourt Books for Young Readers, 2016 (hardcover), 2017 (paperback). [author site] [publisher site] Review copy and cover image courtesy of the publisher. My book talk: The rough North Sea taunts Elsie, as the 16 year old struggles to remember what happened five years ago on this shore, where her twin Eddie vanished, her parents splintered to bits, and all the town gave up on her family. Skipping school and retreating to the abandoned boathouse, the Scottish teen is startled to meet mysterious Tay and his pals there, free divers who dare the sea by diving deeper and deeper without oxygen or safety gear. Of course, Elsie convinces the guys to teach her to free dive, certain that her memories about her mentally challenged twin’s disappearance will be unlocked by the depths. But, what secret is Tay hiding? Will Elsie ever remember what happened to Eddie? Can anything put her family back together again? Why can’t anyone remember Tommy? His best friend since 2nd grade, boyfriend since 8th grade, love of his life – by his side on July 3rd, gone on July 4th, and no one remembers him but Ozzie! Just published this week, you can find Ozzie’s story – with each chapter title showing a smaller and smaller diameter of the universe from science websites – at your local library or independent bookstore now. What do you do when a friend leaves? Book info: At the Edge of the Universe / Shaun David Hutchinson. Simon Pulse, 2017. [author site] [publisher site] Review copy and cover image courtesy of the publisher. My book talk: If Ozzie can just find where his boyfriend Tommy has gone, then the high school senior can stop his family from disintegrating, celebrate gender-fluid best friend Lua’s musical success, and prove to everyone that Tommy does exist! And discover why lab partner Calvin started cutting himself after quitting the wrestling team. And stop the universe from shrinking, shrinking, with his little Florida town at the center. 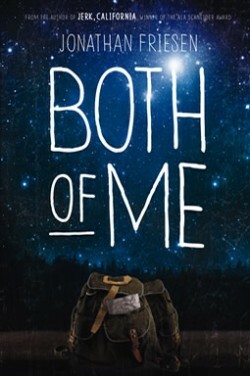 I heard authors Hannah (Not Otherwise Specified, which I love) and Kat last month at TxLA as they discussed fandoms, friendship, and writing this book together totally through chat and email – so good. Ask for this April 2016 release at your local library or independent bookstore. And for more on real-life fandoms and cons (“Up Below” is a fictional TV show), look for Sam Maggs’ Fangirls’ Guide to the Galaxy which I recommended here. And it’s National Readathon Day, too!! Share what you’re reading today with hashtag #Readathon2016. 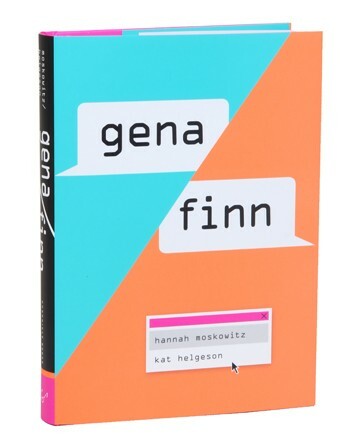 Book info: Gena/Finn / Hannah Moskowitz & Kat Helgeson. Chronicle Books, 2016. [Hannah’s site] [Kat’s site] [publisher site] [authors’ video] Review copy and cover image courtesy of the publisher. My book talk: Brought together online by the fanfic and fanart that they create for a beloved TV show, two young women bond immediately and experience friendship’s highs and lows as other relationships falter. Fanfic stories by Evie (short for Gena’s online name) that fill in the gaps in their favorite TV cop show inspire Finn (for Stephanie) to start drawing again. Sharing her art with Evie leads to numerous email and chat exchanges as recent college grad Finn and high school senior Evie find so much in common. Should Finn really have followed boyfriend Charlie to California after college? Is getting into an Ivy League school truly in Gena’s best interests? Why won’t Gena stay in the room with cast members of “Up Below” when this fancon is the reason she and Finn traveled from opposite coasts to meet in person? Told entirely in texts, chat windows, emails, fanfic, fanart, and journal entries, this coming of age story celebrates the passion of fandoms, the strength of women’s friendships, and the unlikelihood of completely outrunning one’s past. Scam artist teen always on the move meets an artistic young man with two personalities and a near-psychic knowledge of what she’s running from – how can Clara resist trying to tap into what Elias “sees”? But Clara never planned on falling for Elias or struggling to understand his dissociative identity disorder or making a road trip toward answers that could imperil them both. Completely different worlds from the dystopia that Friesen brought us previously in Aquifer (my notes here), the Salem that calm Elias wanders through in his mind, the minutely ordered existence that angry Elias tries to catalog, and the everyday world that Clara longs to leave behind. Is there ever just one personality inside you? Book info: Both of Me / Jonathan Friesen. Blink, 2014. [author site] [publisher site] [book trailer] Review copy and cover image courtesy of the publisher. My book talk: Dual-personality Elias somehow knows more about her past than Clara wishes to recall, but their journey to verify the answers stretches both young people’s affection and endurance – and Elias’ hold on reality. Year 9 is tough on Clementine, with her best friends and family members growing away from her, until fascinating Fred arrives, dressed like a dandy from a bye-gone era, asking her to join his steampunk world and truly become the self she writes about in her philosophy class journal. This Australian title arrives in the US on Sept. 1st , so your local library or local independent bookstore should be able to easily get it through Independent Publishers Group. Several in-school personas in Writing Clementine don’t match up with their leisure-time pursuits – what’s the most unusual public-private contrast you’ve seen? 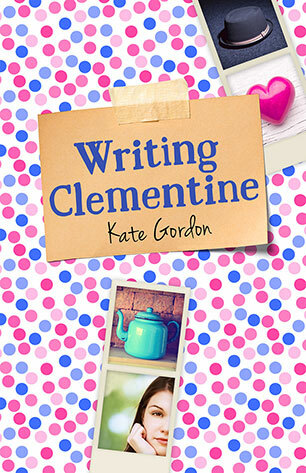 Book info: Writing Clementine / Kate Gordon. Allen & Unwin, 2015. [author site] [publisher site] Review copy and cover image courtesy of the publisher. My book talk: Clementine feels left behind as family and friends change, so a new student’s invitation to role-play in a steampunk society lets the Tasmanian teen experience acceptance and romance that she never even dreamed about in her journal. Her best friends demand that Clem grow up in a hurry, then they move on. Her brother’s been holed up in his room for a year, and she feels responsible. Her philosophy teacher requires daily journal writing, but won’t read or comment on it unless asked. A new student moves to town, like a reviving breeze with his elegant clothes and intriguing smile. Fred is such a contrast to creepy Sam and the other boys at school! When Fred introduces her to the Burnie Steampunk Society, Clem finds new friends as they pretend to live in Victorian times. Can she ever accept that Fred likes her just as she is? Why can’t she just fix what’s wrong for her beloved big brother? What should she do about Sam’s unwanted attention? Every Last Word, by Tamara Ireland Stone (book review) – can poetry save your life? Most folks toss around “OCD” for any neat-freak behavior, but Pure-O (Purely Obsessional) OCD isn’t that at all. Reading Sam’s tumblr gives glimpses into the teen’s life, worries, and soul-searching. This strong book was published in June, so your local library or independent bookstore should have it for you now. Stone wrote it based a young woman that she knew, then fact-checked all behaviors and responses with mental health professionals to bring us a very true Sam. Venture down the stairs, into the Poet’s Corner – will you bare your soul and share your thoughts with others? 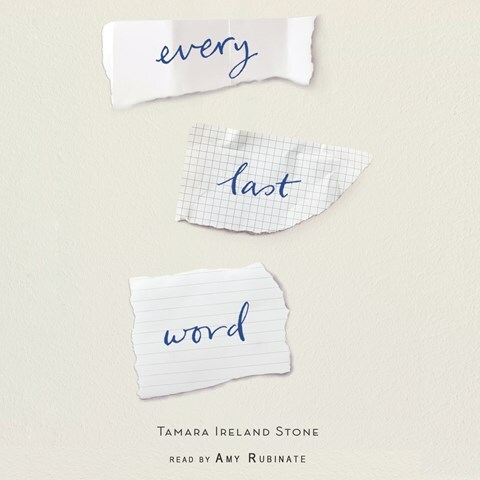 Book info: Every Last Word / Tamara Ireland Stone. Hyperion Teens, 2015. 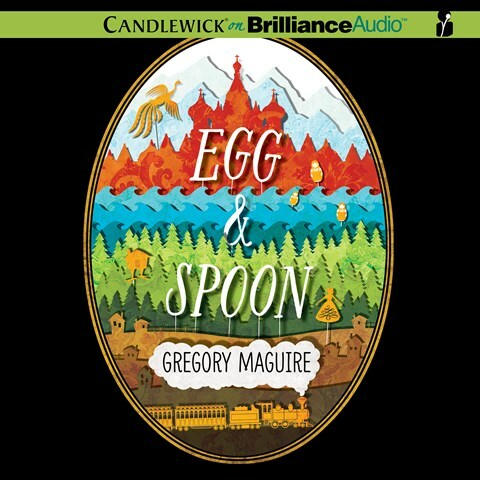 [author site] [publisher site] Review copy and cover image courtesy of the publisher via NetGalley. 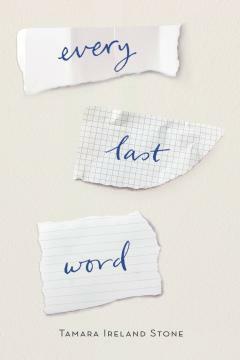 My book talk: Sam keeps her obsessional OCD and her at-school persona separate until she is befriended by Caroline and dares to share in the hidden Poet’s Corner. Her best friends are the Crazy Eights, the popular, snarky girls at their high school – Samantha can never let them know about her obsession with 3s or the dark thoughts that careen through her head. She could never tell the Eights about her new-found friendship with smart and unstylish Caroline or share with her therapist her growing attraction to the guitar-playing guy in the Poet’s Corner – why not? As the poets share their deep feelings and funny reactions to life, Sam discovers her own voice and realizes that she’s grown away from the Crazy Eights – but will she be able to cope with the bullying that her long-time friends will surely unleash if she leaves them? Little brother thinks he’s a super-detective. New guy at their vinyl shop has a secret. Sky isn’t sure what’s worse – Dad ignoring the eviction notice, seeing friend Nancy drift away, or her dreams of drowned Mia. Watching Gully all summer will be dreadful, since the 10 year old wears his pig-snout mask always and logs every scrap of conversation like a secret agent – can’t Sky just work at the family record shop and go to concerts like everyone else? 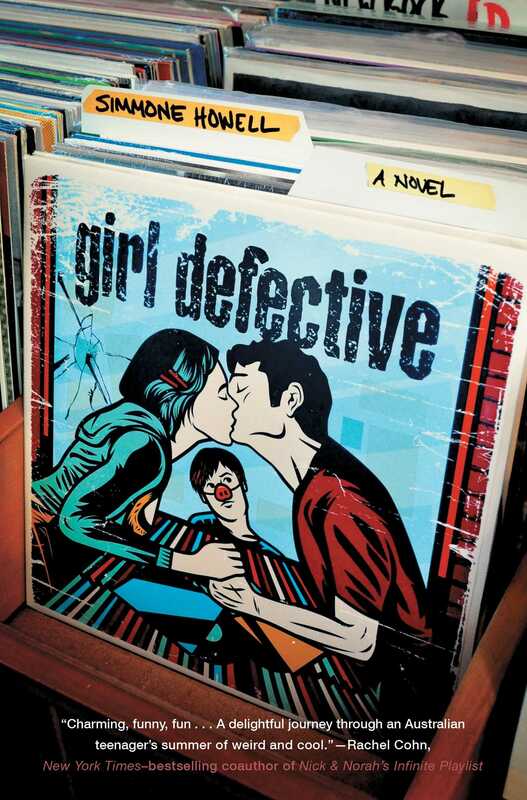 Snag a free excerpt of the book here, then ask for Girl Defective at your local library or independent bookstore. Did family expectations every make you defer a dream job? Book info: Girl Defective / Simmone Howell. Atheneum Books for Young Readers, 2014. [author site] [publisher site] Review copy and cover image courtesy of the publisher. My book talk: This summer, Sky just wants to run her family’s vintage vinyl shop and fall in love, but dire secrets percolate up in their scruffy Australian neighborhood, and her social-skills-lacking little brother Gully keeps calling the police with clues. After Mom left them to “follow her art” and Dad crawled into his homebrew bottle, it’s been up to Skylark to take care of 10-year-old autist Gully (who melts down when everything isn’t just-so) and keep the doors of their vintage vinyl record shop open for collectors. Stylish pal Nancy tries to get Sky out for concerts before a developer razes local venues (“progress” – ha! ), a missing person case is deemed suicide (who’s making those memorial murals? ), and Dad hires new guy Luke to work in the shop (very cute, in a hidden-sadness way) – quite enough happening in St. Kilda before the eviction notice arrives. What will become of the vinyl shop? Did Gully really find clues about Mia’s death? Could Luke really be interested in Sky? Darren’s life seems so out-of-his-hands right now, after the divorce and Dad’s lifestyle change and Nick being at college. Just published last week, Me Being Me is Exactly as Insane as You Being You lets Darren tell his story in his own way. What have you done to keep things under control during an extremely hectic time? 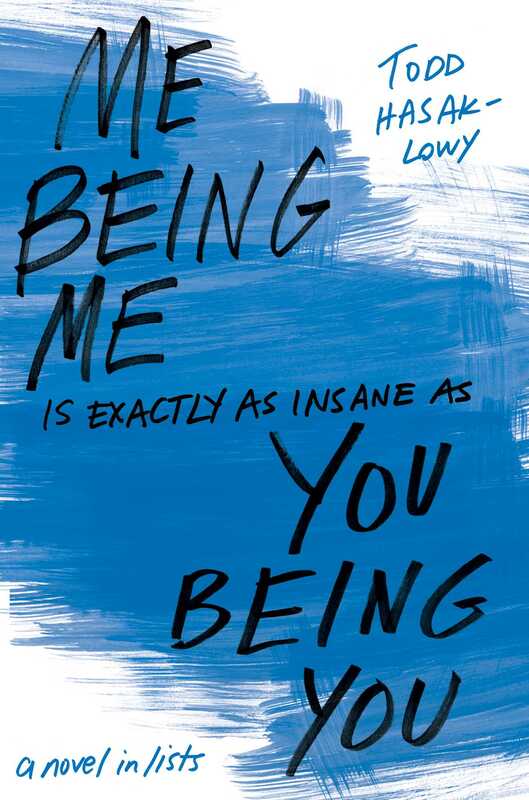 Book info: Me Being Me is Exactly as Insane as You Being You / Todd Hasak-Lowy. Simon Pulse, 2015. [author site] [publisher site] [book trailer] Review copy and cover image courtesy of the publisher. My book talk: Making lists and enduring all the changes in his life leaves Darren enough energy to skip school (just once), get in trouble at brother’s university (just once), and have two girlfriends at the same time (just once), but the high school junior is still trying to figure things out – in lists. After Dad and Mom divorced, they both were different – Darren’s not sure he likes either change, but what can he do? Making lists helps. Names that he’d rather have, reasons that he can’t drive yet, ways to convince Zoey to take him to see Nate at college – lists are good. Is visiting Dad’s new place going to be okay? Where has Zoey suddenly gone?